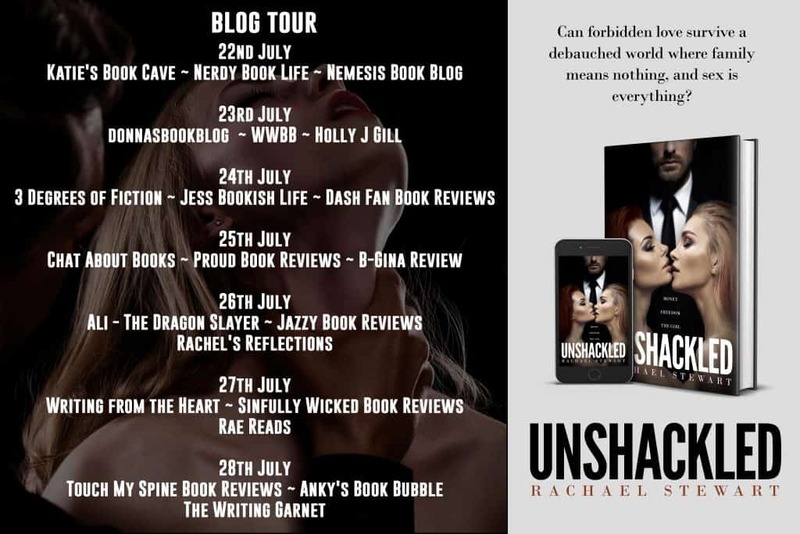 Unshackled is a thrilling ride of sexual awakening, love, money and corruption… Trying to escape the evil hold of her stepfather, Abigail becomes a player in a wildly debauched world that has her body hitting a plethora of sexual highs, while her heart clings to her new-found love and the desire to be free. But can she break away and keep it all—the money, her freedom and the girl? Or will she lose everything? Welcome back all, I hope you're looking forward to this bonus post. I chose to participate in this book tour because domestic and family violence is a topic that is rarely discussed in it's dirty and truthful facts and I was interested to see how Rachel Stewart addressed this. However reading this novel I was really surprised and I was really happy to read how Rachael wrote this. When signing up for this book tour I was given all these warnings about how domestic violence is portrayed in this novel, and that it might be tough to read etc to I was expecting to read some pretty gruesome details. But I was pleasantly surprised when the details were kept to a minimum and we explore the aftermath of these events rather than the events themselves. So I commend Rachael for this, it allows for the book to be pleasurable to read while also addressing real life issues and concerns that many people face. I also liked the fact that she didn't explore just the physical aspect of domestic and family violence, but also the mental and financial control that can play a part in these circumstances. So let's get into the nitty gritty of the book then! We start of with Abi when she first meets Emma and it's instant attraction. Only problem is Abi has never been attracted to women before. So what is she meant to do? Having known women who were only attracted to men and then met a particular woman who attracted them and resulted in a relationship I was curious to see how Abi would deal with these emotions and the confusion it would inevitably bring along with it. What I quickly figured out was that this seemed to be a matter of love at first sight kind of deals and that Abi was sick of living under her step fathers rule but didn't know how to leave that control without loosing her lifestyle. So what is Abi to do? Every time Abi and Emma hook up and her stepfather finds out about it Emma get's punished. Physically. So not only is he controlling Abi's access to money and therefore her lifestyle, he is also emotionally, financially and physically controlling Emma in order to garner more business deals to increase his current wealth. Up to the physical control Emma is ok with this as she chose to lead her life like that, however she never intended for a guy to control her physically. So when that starts happening she's prepared to walk away. After a fair bit of drama where both Abi and Emma are abused further by Abi's stepfathers associates they finally seem to make the break they are looking for. Only to have the good doctor and stepfather find them and break in to physically take control of them once again. Luckily Abi seems to have been able to keep her head clear and calls for help which results in the physical safety of both women. I can't begin to imagine what real life victims of domestic violence go through before they choose to finally leave, or what they go through emotionally afterwards. I'm glad Rachael showed me a little bit about what they could potentially go through. Her writing style really wrapped me up in the story and got me involved to the point where I made my partner cook dinner just so I could finish the book. I just wanted to know it ended ok, and I wanted to know what happened to both women after experiencing that. In a way I'm glad Rachael didn't try to explore their emotional and mental states after going through that trauma as I'm sure it wouldn't do it justice compared to what those victims actually feel. But I'm also kinda disappointed because maybe then it'd help make people realise that there are more forms of domestic and family violence than just the physical abuse. Without giving too much away, I really enjoyed reading this novel and I'm glad I decided to go ahead with this one as I know it's a topic not many people are willing to face. It's almost like people try to brush this topic under the carpet so I commend Rachael for addressing it head on. And I hope for those people that read this they can gain some form of insight into the various forms of domestic and family violence and can be more empathetic to those who find themselves trapped by these situations. If you're interested in reading this book (and I recommend that you do) you can find it at the following locations, so I've included the link to Smashwords here for you. And finally! As we often see with blog tours there's some free giveaways for anyone that's interested! FINALLY! I hope you've enjoyed the surprise post. At the time this post is released I will be wondering around Queenstown in New Zealand so I hope you've enjoyed the read and I will see you again in my next post.